After last night’s/this morning’s game, I bet no wonder is wondering why I chose the Denver Broncos to represent the AFC in the Superbowl. Two words: PEYTON MANNING. Unless you have been living under a rock then you know Manning is my absolute favorite player. I have been a fan of his since his days at the University of Tennessee. Other than watching my 9ers or Panthers play, there is no one I would rather watch on opening night than #18. The man is a legend and he did what legends do, they deliver. 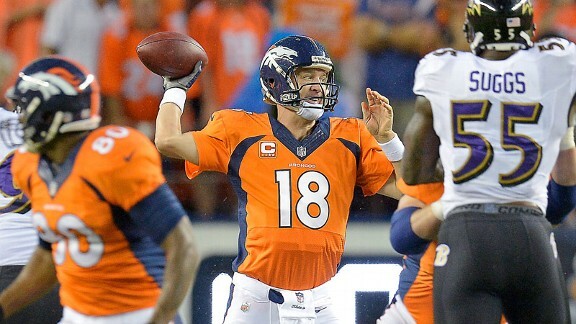 Any questions people still had about Manning’s arm were put to rest tonight. The stats read 462 passing yards and seven, yes SEVEN, touchdowns . Talk about making a statement. The precision in which Manning carves up defenses is a thing of beauty. I could go on and on but I will not. I will save some for the rest of the season. P.S. This is the first year I did not get to draft Manning as my fantasy league QB. Someone had the nerve to draft him before me, IN MY LEAGUE. Do not get me started. Don’t worry…..I drafted him. You gooooooooood…..lol. Not a major fan of Payton but I must give props when due. Dude got bizzzzzzzzzie.